Merriam Webster defines sharp as "1: adapted to cutting or piercing: as a. having a thin keen edge or fine point [...]"
Whew, okay now that the obligatory vocab quiz is out of the way, lets delve into some of the finer points of what makes something sharp. We have all been cut at some point by something sharp (not counting a witty comeback...ha! ), whether it was a knife, a chisel, or a piece of paper. All of these items are sharp for the same reason. 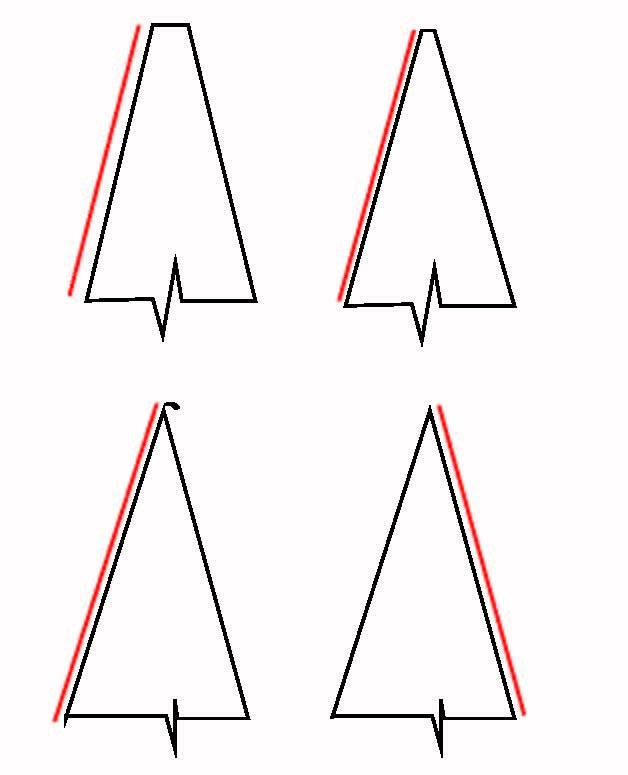 They all have two flat intersecting surfaces joining at an acute angle thus reducing the force you must exert to achieve the required pressure to sever a third surface. Get it? I'll see if I can make it more convoluted and unnecessarily confusing. 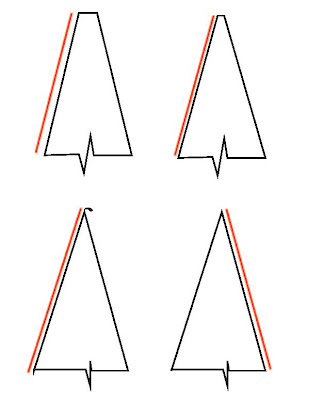 Basically, a sharp surface is sharp because it comes to a continuous point along its edge. 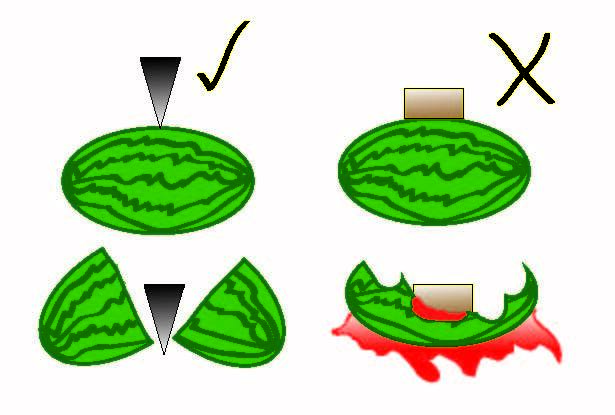 A sharp edge requires much less force to slice through an object because of the extremely small area it has in contact with the item being cut. There is an appropriate equation that describes this interaction. Both pressure and force are exerted on the object being cut but they are not the same concept. Imagine the difference between force and pressure this way, the force you exert on the floor when standing on both feet is equal to the force you exert on one foot. The pressure you exert on one foot is twice the pressure you exert on two feet. Each item has a required pressure before it yields. If you stood on a pool of jello you would go right through the jello as opposed to standing on concrete. In summary, pressure cuts and force accelerates the object through the cut. Still confused? Good, I have another thought experiment I want to use. 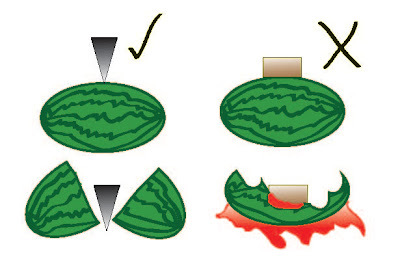 Think of it this way, a knife slices a watermelon much better than a brick. Really, to push a brick through a watermelon takes a lot more force than pushing a knife through a watermelon. That's because the knife has a much smaller area in contact with the watermelon than the brick does. This same concept applies with your woodworking tools. Whether it's a chainsaw chain or a plane iron, the smaller the area of the cutting tool in contact with the wood (the sharper it is) the less force that is required to achieve the pressure required to cut the wood. This is the reason it takes so much less effort to cut wood with a sharp saw than a dull one. In sharpening metal tools, the goal is to remove material along both edges creating two flat polished surfaces which intersect at the angle best suited to maintaining the sharp edge on the tool. We have already explored the concept that a smaller contact area results in less force required to achieve the severing pressure of the wood you are cutting, now lets take a look at the edge of a cutting tool. For this example I will use a little sketch of a tool edge, however, the concept is the same for anything that you want to be sharp. Enough material should be removed from each bevel edge on a cutting tool so that when each surface meets they are joined by as little material as possible. Ideally they would meet at a 1 atom thickness, in reality this is not the case with hand sharpened tools. Imagine the illustration below is a series of super magnified photos of a tool edge while it is being sharpened. This tool would happen to be a double bevel tool like a marking knife edge but for a chisel just imagine one side is flat and one side is angled. When the tool comes from the manufacturer it has a very dull edge like a screwdriver. If you were to sharpen the tool along the edge marked in red (oversimplified I know) you would begin to remove more and more material until the two beveled surfaces meet. The second image with a flat top might be sharp enough to cut you but that doesn't make it sharp enough to sever wood fibers cleanly. The tab on the edge of the third photo is the burr (exaggerated for clarity) or wire edge. As you wear away material on one side of the blade the two sides will eventually meet and when they do a burr will form as a result of the deformation of the material along the sharp edge. This is good! Once the burr is formed you would flip the tool and remove the burr giving you a very sharp edge. As long as you have ground your bevel angle and polished both surfaces to a reasonable reflective surface, at the point of burr development you really begin honing. The honing process is in an effort to polish the two, now intersecting, surfaces. 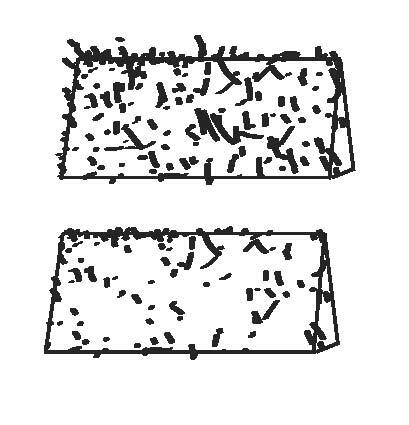 The reason you want to polish the now flat, smooth, evenly intersecting surfaces is a matter that has its roots in the microscopic realm. Steel is actually made up of a mass of microscopic crystals or grains. As you can imagine the bonds between these crystals are actually what we are shearing off when we sharpen a steel blade. 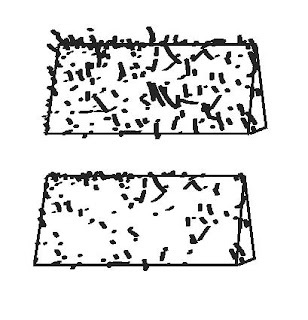 The remaining edge of a sharpened tool is made up of these individual exposed crystalline structures. Leave it to someone much more adept at explaining this than me to have posted a great example of this concept here: "Of Course It's Chris Schwarz' Blog." Now, in comes Carbon. Carbon takes advantage of the crystalline structure in steel to make the steel harder (insert frat guy joke here). At the risk of oversimplifying this too much, the basic idea is that when carbon is added to steel, the carbon works its way in between the steel crystalline structures and increases their bonding ability thus making the steel harder. To a point, the carbon will continue to make the steel hard, but with hardness comes brittleness. The harder the steel is the more brittle it will become as well. This extremely hard steel is difficult to sharpen but will hold an edge very well. A fine balance is required for good tool steels. At this point the addition of other elements into the tool steel such as Manganese will give the edge additional hardness and durability. If you would like to know more about tool steels and sharpening check out Ron Hock's book "The Perfect Edge". So, in summary the more you polish the tool edge with finer and finer grit abrasives the more you even out the jagged crystals poking out along the microscopic edge of the tool. If you could possibly get these to all be perfectly even (you cant) and thin out to one atom thick at the apex of the point you would then have the essence of a "perfectly sharp" blade. To achieve a most perfectly sharpened blade beyond typical honing, however, becomes a full time job and you can forget about actually doing any woodworking. The goal of sharpening a woodworking tool is to get it sharp enough to be accurate, controllable and strong enough to cleanly shear the fibers of the wood you are working with. A good way to check the sharpness of your blade, in my opinion, is to shear the endgrain of a softwood scrap. The softer the wood the better, but a piece of soft pine will work just fine. Just pare off the endgrain with your sharpened steel and if it leaves a clean, burnished-looking, surface it is plenty sharp.